On Saturday, October 24th, I spent nine hours in lockup, along with more than sixty-five of my Black comrades and our allies, at the District 8 police station in Chicago. We were arrested after shutting down the International Association of Chiefs of Police Conference. Our goal was to disrupt a gathering in which law enforcement from around the globe share tools and tactics for our censorship, torture, and murder. In my life as a young, queer, Black man, it was my third time being arrested, my second in Chicago. Some parts of the booking and charging process were routine, while others shed new light on the system. I had never been arrested with so many other people at once—the majority of them women, queer, and gender nonconforming. I had never intentionally allowed myself to be arrested. And I had never been arrested in an action for economic justice, explicitly calling attention to the fact that investment in policing is a disinvestment in Black communities. 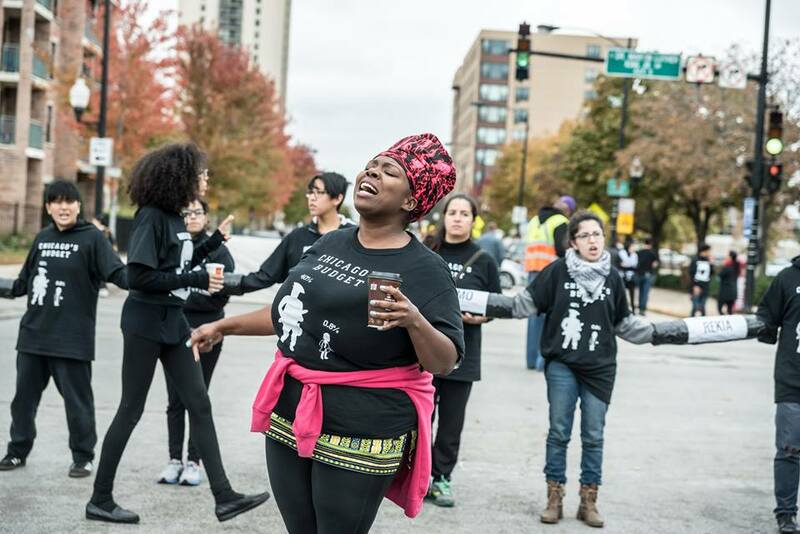 Of the 66 protesters arrested in our action, at least 46 were women, or people who identified themselves as women for the sake of the action—attempting to protect themselves from being held in isolation, or being otherwise stigmatized by police. The influx of “female” arrestees dumbfounded police, who did not have enough women officers to comply with their own policy that suspects must be searched and escorted by officers of the same gender. But the makeup of our group caused confusion for another reason. The CPD’s policy on the arresting and processing of trans, intersex and gender nonconforming people was a hard-fought document meant to protect our people, but which unsurprisingly ends up stigmatizing us in new ways. While it ostensibly shields queers against being searched or asked invasive questions to determine their gender, it is common knowledge that these illegal procedures continue to take place. Moreover, the document’s poorly-worded language and reliance on state ID means that the process of arresting and booking trans and gnc people is still deeply triggering, and opens them up to different—not lesser—forms of violence. The policy also outlines that any person who identifies as trans, or whose stated gender does not match what is on their ID, must be held in isolation “for their own protection.” Since we know that one of the most serious threats of violence that women, trans and gnc people face in the justice system is assault by police and corrections officers, and that instances of assault increase when women, trans and gnc people are held solitarily, this supposedly sensitive form of policing hardly makes the arresting process safer or more just. The ultimate result of the measure is that trans and gender nonconforming people, if they hope to avoid solitary confinement, must pass as cis in the eyes of police, or else actually have to conceal their gender identities to avoid being targeted. In our action, many queer, trans and gnc arrestees consciously misrepresented their genders as a buffer against police violence. Even so, there were multiple instances of transphobia—from one gender nonconforming person being referred to as “it” by their arresting officers, to a woman officer flat-out refusing to process two other gnc people until being instructed to do so by a lawyer. While these instances represented real violence against our community, they also illustrated how women, trans and gnc people confuse the deeply sexist institution of policing, and, even with some semblance of a policy in place, how totally unprepared police are to deal with the complex realities of our bodies and genders. By putting their bodies on the line in such huge numbers, women, trans and gnc people led the charge of our action, and clogged the booking process—making it take longer, but also protecting protesters from more serious charges that may have required even more paperwork and hours. And by strategically avoiding isolation—though it notably did not prevent profiling and verbal abuse—women, trans and gnc protesters were able to keep an eye on each other and better advocate for one another when moments of sexism and transphobia did occur. When we talk of the prison industrial complex, we often focus on employment within that system, the price of building new facilities, etc. Yet our experience in lockup pointed to different reasons for a distended policing budget. The framework of our action was one of economic justice. We specifically called attention to mayor Emanuel’s 2016 budget, which allots nearly 40% of available public funds to policing—up $200 million from the year before. We know that the city of Chicago spends $4 million a day on it’s hulking policing apparatus—more than it spends on mental health services in half a year. Because of the large number of arrestees, many of us were held in nontraditional spaces—hallways, waiting rooms, and even private offices—giving us an expanded view of the precinct and its workings. As we were shuffled from room to disheveled room, seated on warn chairs, against crumbling walls, observing the dilapidated cabinets and storage units, and the dismal disorganization of the filing system, many of us began to wonder: Where is that $4 million going? We often blame police themselves for sucking resources from our communities. Yet as the police budget skyrockets, officers face the same cuts to benefits and pensions on the city and state levels faced by teachers, firefighters, and other state employees. The funding of public safety, then, is decidedly not about the supporting of public sector workers. Our time in lockup raised important questions about how the millions the city of Chicago grants to policing are actually spent. Might it be the monitoring of activists and oppressed communities, surveillance technology, military-grade weaponry, and contracts with the corporations that provide these services that are the major reasons for the city’s inflated budget? Barack Obama’s closing remarks at the IACP Conference—a plea for gun control, and the importance of ensuring that police are not out-armed by the criminals they pursue—was a thinly-veiled salute to the weapons industry, given in a moment where police deaths are at an all-time low, and the extrajudicial killings of Black people happen at a rate four times higher than at the height of the lynching era. This is what the public safety budget is about: Not funding pensions, salaries and working conditions for police, but subsidizing the US’ core industry—weapons and war. Black liberation means targeting weapons manufacturers and the global war machine itself, not simply the policing of our immediate communities. Organized Communities Against Deportation, Not One More, Fight for 15 and the Brown members of other organizations played major roles in the planning, execution and supporting of this action. These organizations did not participate under the usual slogans of solidarity—“These are our issues, too”—but, significantly, shut down the IACP in explicit support of Black lives. Even given the outspoken tone of the action, and its clear demand for economic justice in Black communities, Arab, Native, Asian and Latino allies all put their bodies on the line—and all faced their own specific forms of targeting and violence at the hands of police. A Latino ally arrested with me and a group otherwise comprised of cis Black men was immediately zeroed in on by police. Questions about his citizenship and ability to speak English were brought up without provocation, and he was berated by officers who assumed he was lying about his age, birthdate and other basic information. While the Black men in our group were unnecessarily manhandled and spoken down to, Brown allies saw language, citizenship, and other racist cultural assumptions used as tools for their provocation and intimidation. Officers weren’t just prejudiced—they were strategic in who they targeted, and what kinds of perceived weaknesses would cause the most harm. While Black protesters dealt with the most direct violence in the arresting process, Brown allies faced their own tailored forms of profiling and degradation. Just as our identities are linked but still distinct, so, too, are the ways policing seeks us out as targets. The lesson was that while Black liberation is at the root of racial justice, radical solidarity means a range of strategies—based conscientiously on the identities of those taking action—are needed in the struggle to address the multifold forms of racism inherent in policing, and to undo racism in our society at large. One of the major concerns for organizers putting together the IACP shutdown was the fact that McCormick Place is located south of the Loop in the largely Black community of Bronzeville. What would the tone of an action for Black lives be as it disrupted a Black neighborhood? Would the protest be seen as targeting the wrong people, having the opposite of the intended impact? When we arrived at the conference it was already swarming with security and police. Over the five total hours the action lasted, whole squads, swat teams and their commanders traveled from location to location, directing traffic, removing props and artwork from the protest, and cutting protesters out of their blockades. As a result, only two patrol cars were left to circulate the entire Bronzeville neighborhood. Whereas the concentrated police presence due to the conference could have resulted in intensified police violence, the shutdown meant that police efforts were refocused on protesters, instead of Bronzeville residents. Additionally, the more than nine hours protesters spent in lockup not only diverted police labor into processing instead of patrolling, it also meant that the few arrestees brought in that were not a part of the action had a larger number of ears and eyes surrounding them. More protesters meant more witnesses, more attention from media and legal council, providing a small but potent defense of all those in the precinct. We learned that a well-organized direct action—including one staged in a Black neighborhood—protects Black communities from police violence by drawing resources away from the surveillance and profiling of the general population, and by generating attention and scrutiny that serve as an extra layer of defense for arrestees. If the goal of direct action is to disrupt systems and take back power, we achieved this by distracting police from their deadly business-as-usual. At no other moment in my life was it more clear to me that the funding of police is the funding of Black terror and death, and an open investment in the continuation of the racist violence upon which the US was founded. Never was it more clear to me that reparations for what our communities have already endured must come in the form of public schools, a living wage, universal healthcare, and the permanent abolition of police and prisons. Never was it more clear to me that women, trans and queer people, Native, Black and Brown folk will always be the targets of the imperialist war machine so long as it is allowed to chug on without interruption. And never have I been more sure that those same people will always be the vanguard of interruption, will always survive, will one day be free. Powerful descriptions and visual details. The ‘vanguard of interruption’ ought to be our bumper stickers! Thank you for the insight. A powerful post! I have a lot of respect for the action your taking. I was part of ACT-UP protests and LGBTQ direct action including Queer Nation protests back in the early to mid ’90s so I have a bit of understanding about what you went through. I sincerely hope this helps bring the positive change your struggling for. Thoroughly enjoying your perspective. thank you. So sorry for my delay, and thank you for your support!